The Oakmont is a home for all ages, and a home where all ages can reside in harmony. The first floor living areas are smartly divided into formal and informal settings by the impressive open stairway and Georgian-style center hall. Beyond the hall is a wonderful farm-style kitchen and casual family room. In warm weather this family gathering area can be expanded to the deck. A separate dining room and adjacent living room provide pleasant space for more sophisticated entertaining. In the Oakmont it’s quite possible for teens to congregate in the family room, totally separated from parents who are relaxing with friends in the living room. Upstairs are four large bedrooms, three of which share a well-designed bathroom and open into a central hallway, aiding traffic flow on those hectic weekday mornings. The fourth, a master suite with a luxurious corner soaking tub, is tastefully secluded and large enough to include a sitting area or study. 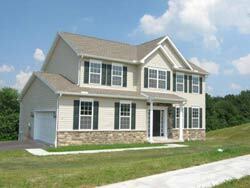 A large family, with children of various ages, can live comfortably in the Oakmont. Its classic exterior charm will compliment any neighborhood.